First I would like to thank the woman who wrote a review of another similar curtain that was 50% polyester. She praised this curtain and mentioned how Battenberg was misspelled which made it easy to find in the search.I have a 9 foot wide living room window that is in 3 sections. I never tried cafe curtains on it before. I wanted privacy on the bottom and more light coming through the top. So l bought 3 of just the bottom panels. 2 curtains were perfect. 1 curtain had a teeny stain in different areas of each panel. I decided to ignore it since each dot was so small l knew it wouldn't noticable when they were hung. I can't see those spots, so its fine.I'm used to a sheer curtain, where l was able to see out. I had made some temporary basic cafe curtains before these and l couldn't see through the curtain when l sat down in my living room. However with this curtain, the lacy part at the bottom allows me to see a glimse of a person walking by without them seeing me. That's a really good feature. Home territory searches the web to find the best prices and availability on Window Treatments and related products foir your home like CHF & You Batternburg Kitchen Curtains, Set of 2 or Valance. 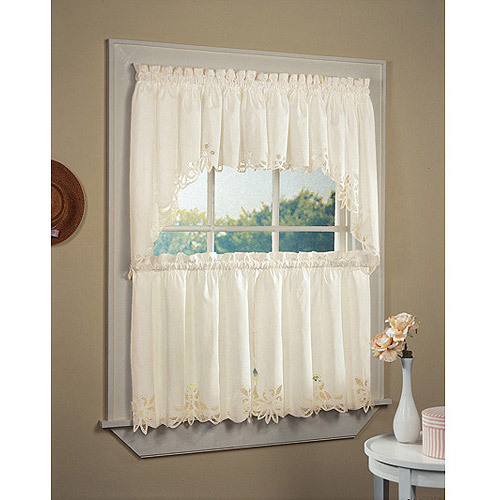 For this page, related items include products we find that match the following keywords: "Window Treatment|Curtain,13" at our vendor partner Walmart - Click More Info / Buy Now to check for price rollbacks!. CHF & You Batternburg Kitchen Curtains, Set of 2 or Valance is one of 85 Window Treatments and related products available for sale through HomeTerritory.com, If you have any questions on this product, please give us a call at 734-971-1210 during the hours of 9am - 5pm EST for assistance. Thank you for shopping at Home Territory, the home furnishings superstore!